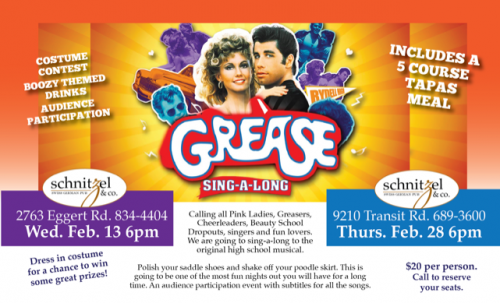 Grease Sing-a-Long and DinnerSchnitzel & Co.
« Trivia Night on Eggert! Calling all Pink Ladies, Greasers, Cheerleaders, Beauty School Dropouts, singers and fun lovers. We are going to sing-a-long to the original high school musical…GREASE! Dress in costume for a chance to win some great prizes! Polish your saddle shoes and shake off your poodle skirt. This is going to be one of the most fun nights out you will have for a long time. It’s an audience participation event with subtitles for all the songs. Includes a 5 course theme dinner served throughout the film for $20 per person. Call to reserve your seats.